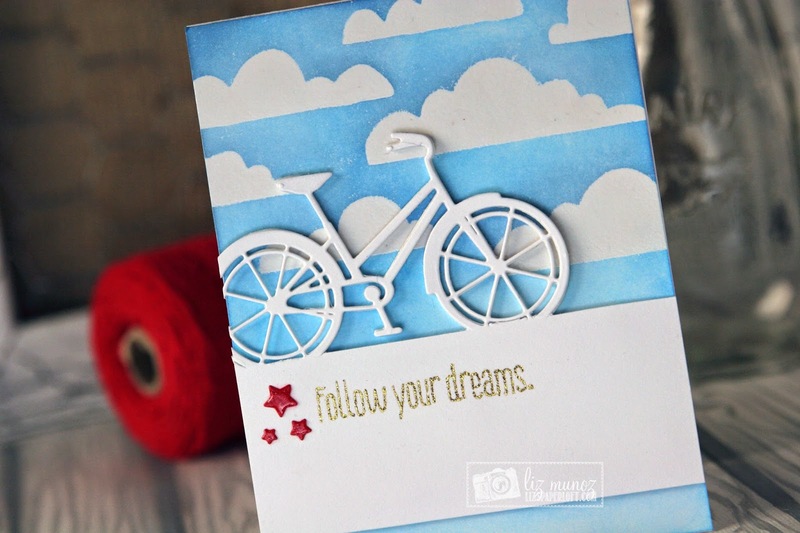 Liz's Paper Loft: MCT Trending Now ~ follow your dreams! MCT Trending Now ~ follow your dreams! Hello crafty friends, today is "Trending Now" over at My Creative Time! Have you noticed all the stencils at "M"s or "HL"? They're every where, but these "babies" aren't the stencils from the eighties! LOL! Well did you know that you can take you dies and create your own stencil? I'm going to try to explain what I did to create this card. The first thing I did was die cut the three cartoon clouds from a 4 x 6 piece of chipboard, spacing them far apart. Next I took the negative part and used it as a stencil to create the background. 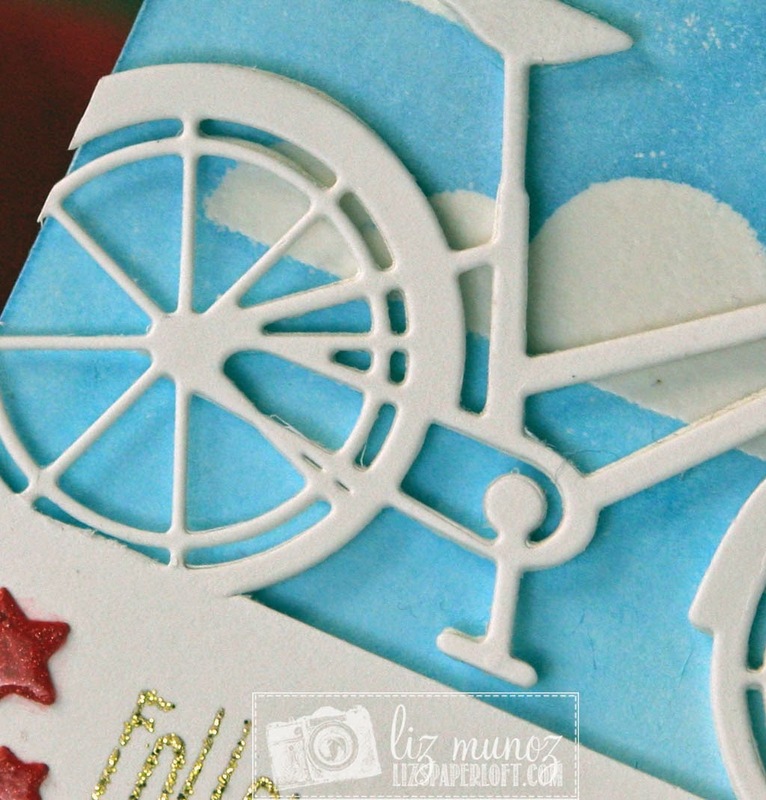 I randomly used the stencil and versamark ink for the clouds then used clear embossing powder and heat set. Once it was cool, I used distress ink for the sky. Before you go out and buy more stencils, take a look at your dies or what dies you want to purchase to see what you can create. Your card is awesome Liz!! What a great job you did!!! OMG Liz I agree your card IS Awesome!! I loved reading what you did to achieve your look....I want to know how you did what you did with your bike die it looks like it's attached to the base I love that. Your little scene is adorable. Super great creative job!! Stunning card Liz. I love the shade of blue with the white. The clouds worked great as a stencil. Amazing how you cut the delicate bike die with your sentiment. Beautiful job. Liz ~ oh my I ADORE this card! The white bike, the white space against the blue clouds ~ BEAUTIFULLY done! 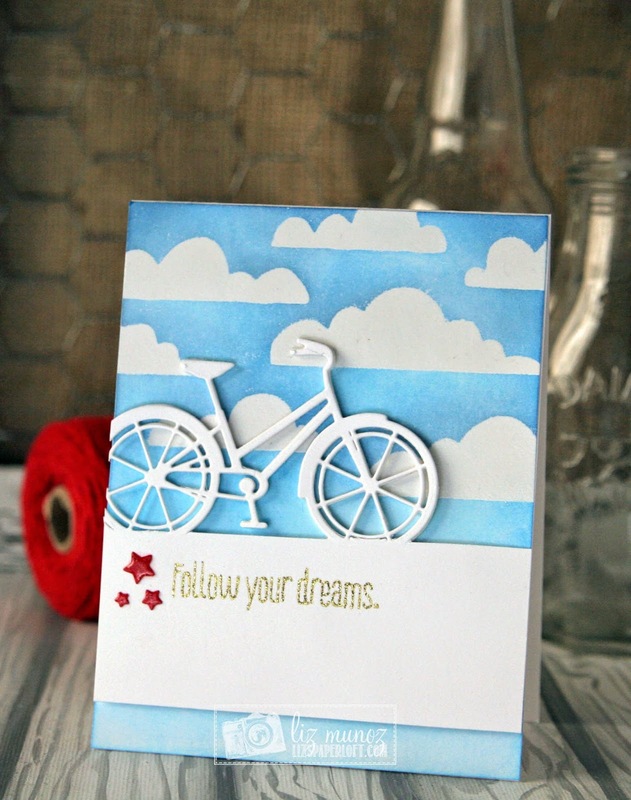 What a pretty card, love how you left the bike attached! MCT Inspire Me Wednesday ~ starfish! MCT Scrapping The Little Things ~ sand castles! MCT Tag It Tuesday ~ thanks! MCT April Release Blog Hop ~ believe! MCT Designer Challenge ~ just a note!